Robert Picardo is the only person to have had a regular role in both a Star Trek series and a Stargate series. 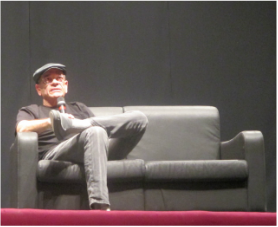 At Malta Comics Expo 2014, Picardo talked about his role as Richard Woolsey. Woolsey was used to extend an episode that was 10 minutes too long. The producers didn’t want to get rid of anything, so they called Picardo in to extend it. Woolsey was really not a nice person, and he was only supposed to be in the one episode. However, the producers liked Picardo in the role and asked him to come back. With each guest appearance, Woolsey gained a characteristic that made him more likable. One of the qualities that Picardo liked about Woolsey was that he was an older person who was trying to learn a new position. It resonated with the economic realities of many older people. “He was an armchair quarterback,” says Picardo, and he had to move into a position of leadership that included fieldwork. Picardo thinks that one of the reasons the show didn’t last as long as the other series in the Stargate universe was that it lacked the tone of the original. Richard Dean Anderson is good at playing to the camera and disturbing the fourth wall without breaking the illusion that is being established. Amanda Tapping is kind, guileless, generous and straight forward, but the entire crew was terrific to Picardo. On Star Trek, they were very concerned with how things sounded. “I would do whatever I did in between the lines,” says Picardo. If he had to shut a tricorder, he would pause and shut it. Then he would continue with his statement. Otherwise, he would have to rerecord the lines which was difficult because of the speed with which he spoke as the Doctor. “Fast talking is very important in science fiction,” says Picardo, especially for exposition. There were no pockets in the Star Trek uniforms, which meant the actors had to be very aware of what they were doing with their arms and hands. When Kes left the show, Picardo suggested that he mentor 7 of 9 because he didn’t want the Doctor to go back to being the windbag that no one listened to.